Nestling at the foot of the snow-covered mountains, Saint-Moritz Roi Soleil stands at an altitude of 1,750 metres (5,740 ft), near the lake that lies by the town. Nestling at the foot of the snow-covered mountains, Saint-Moritz Roi Soleil stands at an altitude of 1,750 metres (5,740 ft), near the lake that lies by the town. Tucked away in this cosmopolitan and very select resort - the birthplace of Alpine skiing - the Resort effortlessly combines luxury and tradition, and offers a wide range of unique pursuits including horse and greyhound racing, polo, or the famous "Cresta Run" on the nearby frozen lake. In this fabulous world of freedom, parents and children can meet up on the play zone after a day's skiing, for a sledging session. Childcare and children's club facilities: Our Resort welcomes children of all ages, with children's club facilities specifically devised for the different age groups and run by professionals. Club Med Baby Welcome: Club Med Baby Welcome for babies up to 23 months - available in most of the Family Resorts if the service is reserved at the time of booking. Leisure activities : Bridge, Guided walks and snowshoes, Indoor pool, Lounge and festive evenings. If you have chosen a package with transport, it includes your return train journey and transfers to and from the Resort. Resort with 311 rooms in a 5-storey contemporary style hotel (with lift). A comfortable and elegant Club Room offering a good standard of comfort, with all the facilities and services essential to your well-being. The Family Club Room has 2 bedrooms. Why not treat yourself to a Peak View Club Room, a comfortable and elegant Club Room with a fine view of the peaks, situated on the 3rd, 4th and 5th floors of the hotel. 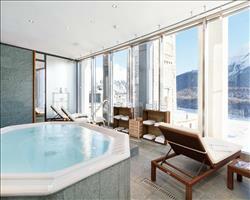 We update Club Med Saint-Moritz Roi Soleil's details often, but facilities do change. e.g. some extras listed by the supplier as "free" or included might only be for the first time you use them, or for one time per party, then charged for further use. If any specific feature is essential to your holiday, make sure you ask us to confirm the details of it before you book your holiday. This all inclusive holiday to Club Med Saint-Moritz Roi Soleil in St. Moritz, Switzerland departs Sunday 22nd December 2019, for a 7 night stay on a "all inclusive" board basis. A local tourist tax (Taxe de Sejour or Kurtaxe) is levied by many councils in European ski resorts. It varies by standard and type of accommodation and is age dependent, so not everyone is charged. It's not included in the basic price of your holiday and is usually paid locally. For reference, the average charged in winter 15/16 was between 50p and £2 per person, per night. St Moritz is THE original ski town, having seen the start of winter tourism way back in 1864. One of the world’s high society resorts, it’s more exclusive than Zermatt but without the bling of Courchevel. With multiple ski areas and stonkingly pretty sights, it has to be skied at least once. St. Moritz lift pass price last reported as 365 CHF (adult 6 day). Ask for a quote when booking Club Med Saint-Moritz Roi Soleil. St. Moritz has NSEW facing slopes. Usually open for skiing October-June. Hotel Monopol St. Moritz Switzerland, Manchester to Zurich 21st December.